Reading Assistant Plus is the new, enhanced version of Reading Assistant, our digital guided reading tool. In addition to the features available in the first generation of the program, Reading Assistant Plus provides new student and teacher resources to deliver an even greater comprehensive guided reading experience—at school or at home—and includes brand new content, with hundreds more passages planned for future releases. For recommendations on how to integrate Reading Assistant Plus into your current implementation plan, see Reading Assistant Plus: What you need to know in MySciLEARN Toolbox. For Reading Assistant Plus instructional plans and lessons, use the English Learner offline resources. Reading Assistant Plus pairs advanced speech recognition technology with scientifically-based reading interventions to help students strengthen their reading fluency, vocabulary, and comprehension. First, Reading Assistant Plus guides the student as he/she previews vocabulary, listens to a model fluent reading of the selection, reads the selection silently, and then responds to comprehension checks. Then, using patented, research-validated speech recognition and verification technology, Reading Assistant Plus listens as the student reads a passage aloud, providing immediate feedback when a student mispronounces or struggles with a word. Finally the program assesses the student’s understanding of the passage by asking questions designed to close the student’s comprehension skill gaps. For an in-depth look at how our speech recognition technology works, see our whitepaper Reading Assistant Plus Technology for Guided Oral Reading. To learn more about the activities in the program, see About the activities. As a general rule, students should use the Reading Assistant Plus program for 20 to 40 minutes a day, three days a week, with more time recommended for older students. When planning your implementation, choose the scheduling method that's right for you. Let Reading Assistant Plus set and manage how many minutes a student spends using the program each day. The program will automatically let the student know when it's time to stop. Choose how long you want the student to use the program each day (20, 30, or 40 minutes), then let Reading Assistant Plus manage your student's time. Opt out of the Reading Assistant Plus schedules entirely and manage the student's time on your own. For more details on schedules and how to change them, see Schedules. Tip: For recommendations on how to integrate Reading Assistant Plus into your current implementation plan, see Reading Assistant Plus: What you need to know in MySciLEARN Toolbox. Students complete Reading Assistant Plus in several stages. See Complete Reading Assistant Plus content to learn how students complete a training session, an activity, a reading selection, and a library. When using Reading Assistant Plus, students practice three critical reading activities—plus a vocabulary preview—while reading a wide variety of content. To learn more see About Reading Assistant Plus content design. Word Wall activity. When the student first starts a selection, this pre-reading activity lets students explore important vocabulary words from the selection, helping English learners build comprehension and fluency while learning the pronunciation of some important English words from the upcoming reading. Step 1 – Preview and Read. 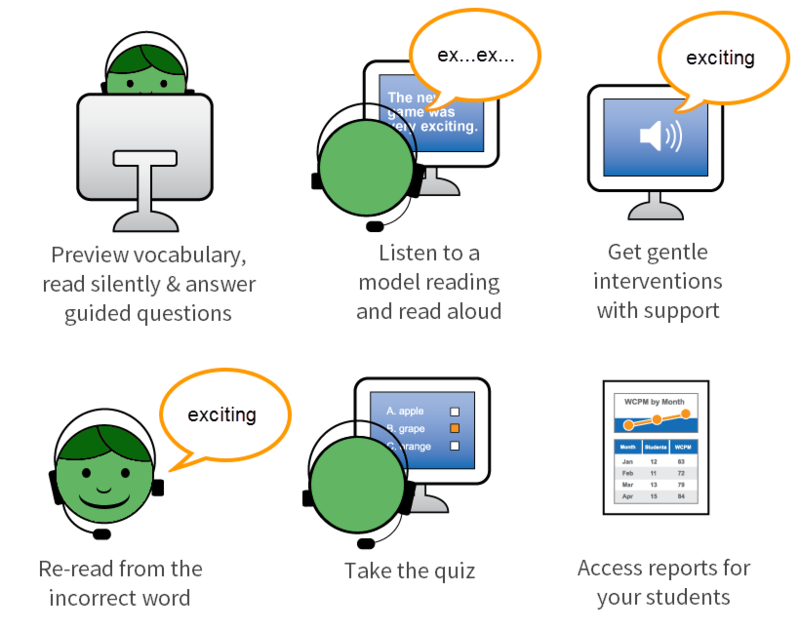 Reading Assistant Plus invites the student to listen to a model fluent reading of a text, to read silently at his or her own pace, and to review word definitions. To improve the student’s comprehension of the selection, the activity provides Think About Its—questions and activities based on the current text. Think About Its act as a during-reading activity, similar to what a student might experience in a guided reading lesson. Step 2 – Read and Record. Using research-validated speech recognition and verification technology, the software monitors a student as he or she reads aloud, providing the much needed practice that benefits all readers. If needed, the software assists the student when challenged by a word. Step 3 – Take the Quiz. This post-reading activity challenges the student to answer comprehension questions about the text. When using a recommended progression method (locked or student-selected), the student must complete an activity before moving on to the next activity, and must complete all activities in a selection before moving on to a new selection. The student can return to a completed activity at any time to work on it again. To learn more see Content progression. Reading Assistant Plus provides English instructional text within the activities. As an alternative, you can choose to present this text in Spanish. To learn more see Instruction language.